Once again, we pick up here where we left off with the fifth part of our new series: Lessons from the RREAR, where we dig deeper into the data found in our Annual Residential Real Estate Activity Report. This is also the final installment of this series -- at least until next year when we have a whole mess a' 2008 data to play with. 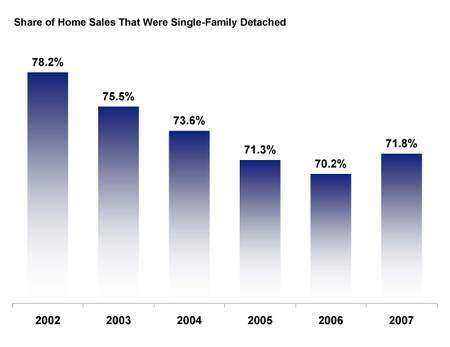 Today's subject, and the final subject of the year: Single-Family Detached Sales. The Twin Cities have always been a "traditional" kind of place, for lack of a better term. We're one of the least-dense metropolitan areas in the country, with our population spread out more diffusely and widely than most regions relative to our total population. As a corollary, the majority of our owner-occupied housing units are traditional, single-family detached homes with yards and fences and lawns (2.3 children optional). As you can see, at least 7 out of 10 of every home sold in the Twin Cities over the last 6 years falls into this category. While this single-family detached majority has steadily shrunk in recent years as the townhouse and condo market boomed (in conjunction with the new construction market, not coincidentally), we appear to have reached our peak (for now), as sales of these types of denser, attached homes retreated slightly in 2007. With foreclosures and short sales taking up a larger market share in 2008 -- and single-family the most prevalent property type in those categories -- expect the upward trend in single-family sales to increase again in 2008. For a look at the geographic boundaries of these MLS areas, visit here. See you next year for more Lessons from the RREAR. We pick up here where we left off, with the third part of our new series: Lessons from the RREAR, where we dig deeper into the data found in our Annual Residential Real Estate Activity Report. Today's subject: Percent of Original List Price Received at Sale. The higher the Percent of Original List Price Received at Sale, the more sellers are effectively asserting control in the negotiation process. With the Twin Cities and national housing markets firmly in the midst of buyer's markets, there's been a significant downward pull on prices. 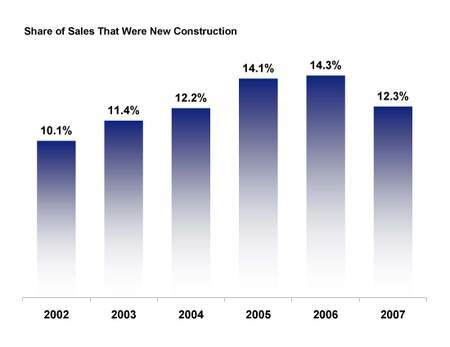 Inventory was at record high levels throughout 2007 (though flattening lately) and home sales slid further down. So naturally, motivated builders and home sellers offered larger discounts from their original asking prices last year to compete with one another for a relatively smaller pool of buyers. There was additional downward price pressure from the increasing market share of foreclosures and short sales. We pick up here where we left off, with the second part of our new series: Lessons from the RREAR, where we dig deeper into the data found in our Annual Residential Real Estate Activity Report. Despite a consistent decline in the number of residents per household each year thanks to an aging population and relatively lower birth rates, the average square footage of Twin Cities homes continued its inexorable rise upwards in 2007. As newer, larger homes are added to the pipeline and existing homes are refurbished and expanded over time, the overall size of our homes gradually increases, seemingly into infinity. This is either fantastic or horrible news, depending on whether or not you're generally in favor of second amusement rooms in the basement for antique billiard tables and pinball machines. Entirely-too-subtle jabs at suburban consumerism aside, what this all means is that every year we seem to have more square footage per person than ever before. So relax and truly enjoy that extra beanbag chair or Barcalounger with no shame. And here are the Bottom 20 areas. Not surprisingly, you'll notice regions here that either a) have a high preponderance of condominiums and/or b) have a relatively older housing stock and/or c) are located in the two center cities or first-ring suburbs. If you're at all a fan of our Annual Residential Real Estate Activity Report (aka "The RREAR") that's released in February of each year, then you're likely a fan of the detailed, micro-level, neighborhood-based data it provides. Square footage, days on market, sales prices, percent new construcion vs. previously-owned...the list goes on and on -- and it's provided for every MLS area we can possibly fit in the damn thing. All of this is to say that the amount of information contained in the 16 page report each year is both a) highly useful and b) difficult to sift through in its entirety without losing your mind. Constrained by the boundaries of the PDF format we're forced to simply dump all the data out to you in a grid of colums and rows, with no regard given to ordering the data or highlighting some trends to note. We're gonna try to rectify this problem by harnessing the power and magic of the blog to dig into the numbers a little further. So let this mark the official beginning of the first post in an ongoing series: Lessons from The RREAR. Today's subject: Price Per Square Foot. While an imperfect science, Price Per Square Foot (PPSF) is in essence an attempt to control for the sometimes volatile data variable of home size and equate the value of the home to a simple financial question: how much house do I get for my money? PPSF varies significantly from house to house and is affected by a variety of factors—location, the type and age of the home, structural and cosmetic condition and much more. Statistically, the Average PPSF by community in the Twin Cities varies greatly from place to place and is affected by all the same factors above, just on a broader geographic scale than a single home.